Hello! 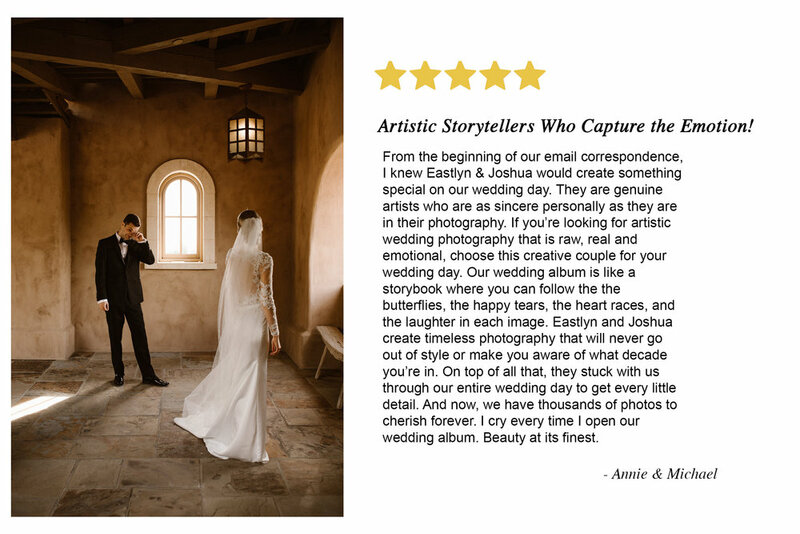 We're Joshua and Eastlyn, a husband and wife wedding photography team that truly cares about YOU. Our basecamp is Dayton and we love to shoot here, but we also travel all over Ohio, especially Columbus and Cincinnati, Indiana, the Midwest, and further for our couples. Our wedding work has been seen around the world in publications like National Geographic, The Daily Mail, Martha Stewart Weddings, Bridal Guide Magazine, and Feedspot Top 60 Elopement Blogs. In addition to the before mentioned, we've already photographed stories in places like France, England, Iceland, Colorado, California, Maine, and the Caribbean, so we readily travel to wherever your love adventure takes you—whether that’s at home or abroad. You can trust us to tell your story because what's important to you is important to us. It may seem like weddings are predictable, but we believe yours is entirely unique, and that's because of YOU. You'll make it personal, and the events of your day will happen in a way that is meaningful to you. In all its beauty, wonder and real moments, your story will be there. We want to capture the events, emotions, and adventures of the day the way that they unfold naturally. We don't need to force cheesy expressions or stage awkward shots because that's not the real story. We simply ask you to do and be YOU. We'll be attentive to and document what matters most to you. Let us help you pause, and deeper than the air you’re inhaling, take it in so that you can always remember this priceless time in your life. We want to be part of your wild, wonderful story. So let's go on an adventure and create something beautiful for your legacy!